A huge peace rally held in Washington, November 15th, was reported by newspapers around the world, but it was not so generally reported that the afternoon was as much a musical occasion as anything else. A five or ten minute speech would be followed by five or ten minutes of music, alternating through the long afternoon. Tom Paxton, another young guitar picker and songwriter, sang two quiet but intense songs. Richie Havens, a young black musician appeared with several friends to give him instrumental support. One played a tall conga drum and Richie got the huge crowd to chant a response, "Freedom," while he sang and chanted in the African style. Leonard Bernstein, the famous director of the New York Philharmonic Orchestra came and, of all things, sat down with a string quartet which the huge audience listened to politely, and I think were glad to see such an unusual form of music on such an occasion. 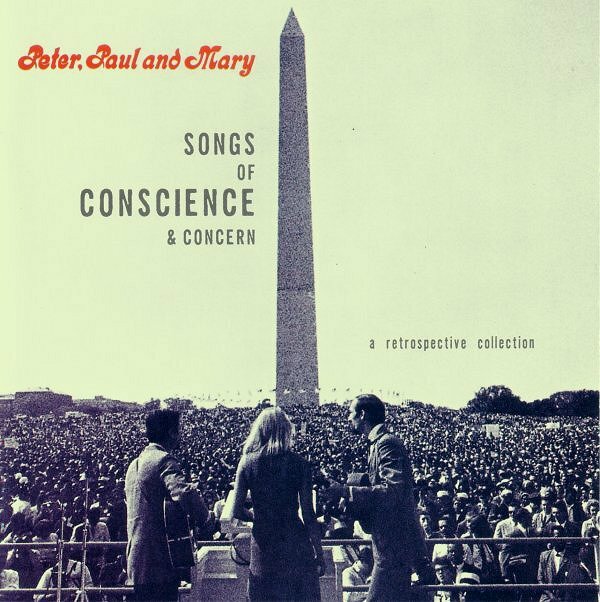 That quote comes from a manuscript in Pete Seeger's files dated November 1969 and appears in the recently published Pete Seeger In His Own Words edited by Rob and Sam Rosenthal. The peace rally was a protest organised by the National Mobilization Committee to End the War in Vietnam held on November 15, 1969 in Washington D.C. and it was attended by over 500,000 protesters*. Humphrey Burton's biography of Bernstein says that he "took part" in the protest but does not mention that he played, while Joan Peyser's controversial 'psychobiography' only refers to the Vietnam rally in the context of Mass, which he was working on at the time. Is the music that the classical quintet contributed to the peace rally identified anywhere? Bernstein recorded the Schumann Piano Quintet in E-Flat Major with the Juilliard Quartet around this time. Was it, perhaps, a movement from that work? Within hours of the conclusion of the premiere Bernstein was playing boogie-woogie at the cast party. As Eric Crozier, the English director, remembered, Bernstein was more interested in talking to Auden, whom he revered, than to Britten, who was no great shakes as a party-goer. Reciprocally, perhaps Britten did not warm to his flamboyant interpreter and never invited him to perform at the Aldeburgh Festival, which he founded two years later. But, despite this, Bernstein retained his affection for Britten's music. 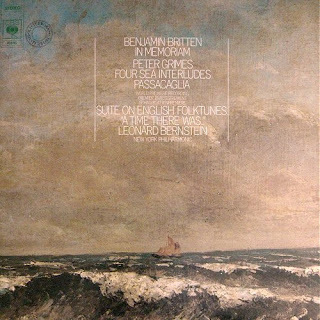 In 1977 he recorded a Benjamin Britten: In Memoriam album for CBS - that is my copy of the original LP below - which included the Interludes and Passacaglia from Peter Grimes. And Bernstein's last concert, given in Tanglewood with the Boston Symphony Orchestra just months before his death in 1990, included a performance of the Four Sea Interludes which Richard Dyer described as "slow, spacious, colorful, atmospheric and majestic". Surprising connections abound: one between Britten and Pete Seeger is revealed here and one between Bernstein and me here. 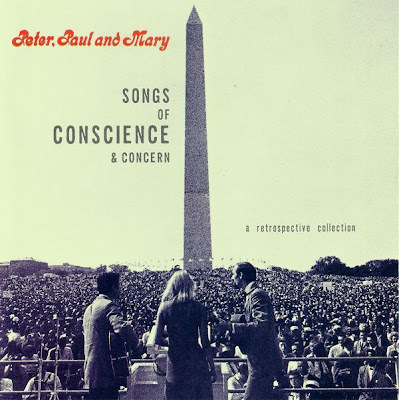 * The atmospheric cover photo on the cover of the indispensable CD of Peter, Paul and Mary's protest songs seen in the header image is the right venue but a different protest: it was taken at the 1963 civil rights rally in Washington. Pete Seeger In His Own Words was borrowed from the USAF Second Air Division Memorial Library in Norwich. Any copyrighted material on these pages is included as "fair use", for the purpose of study, review or critical analysis only, and will be removed at the request of copyright owner(s). Also on Facebook and Twitter.